Today our latest issue of stamps celebrating Migratory Species is launched. 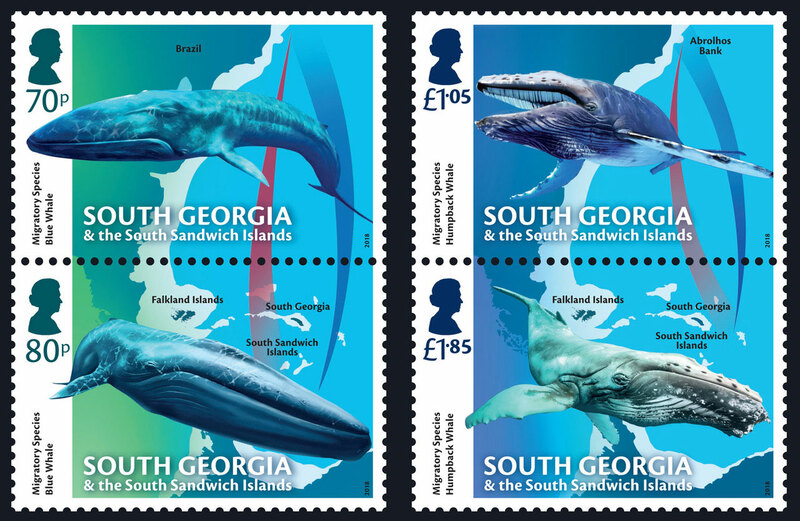 This issue is the first of a series of a complimentary suite of stamps being issued in 2018 by British Overseas Territories including Ascension Island, British Antarctic Territory, Falkland Islands and Tristan da Cunha. The globe is crisscrossed with borders and boundaries, designating countries and states each with its own culture, identity and regulations. However, these geopolitical borders were created by humans for humans and animals follow their own geography, wonderfully oblivious to the way we have divided up their world. Animals often require different habitats and environmental conditions for mating, breeding and feeding and so migrate between areas in order to find the resources they need. Some migration routes are relatively short, perhaps just between one side of a mountain range to another, but some species will travel for thousands of miles. A wide range of animal groups make such mammoth migrations; including birds, mammals, fish, invertebrates and reptiles. Species which make these epic journeys have adapted to time their movements in response to external and internal cues. External cues include a range of environmental signals; including day length, local climate and availability of food. While internal cues may include body condition or the bodies internal, circadian, rhythms. Once they are underway, animals may navigate with the aid of the sun, stars, magnetic fields, winds, currents and even smell, however, the exact mechanisms remain unknown in many animals. Whether by instinct or learned group experience individuals can follow the same routes and return to ancestral breeding and feeding grounds year on year. Because of the large distances, the different habitats and the multiple National borders through which they pass, conserving migratory species presents a particular challenge. The first difficulty is tracking species to find out where they actually go. The advent of modern satellite tracking devices has made this a little easier but even then attaching a tag to wild animals, sensitive to human disturbance, is not always straightforward. Even once a migration route is known, countries along that route need to agree shared conservation goals and enact them under their local policies and procedures. If a conservation threat persists at just one step along the way, the species is put in jeopardy so it is imperative that nations work together. To help facilitate the conservation of migratory species, a number of global platforms exist including the Convention on Migratory Species (CMS), which is an environmental treaty under the umbrella of the United Nations Environment Programme. First signed in Bonn in 1983, this year the Convention celebrates its 35th anniversary. Outside of formal agreements like the CMS, countries work together through a variety of conservation programmes and non-governmental organisations. Conservation initiatives that benefit migratory species include promoting sustainable habitat conservation, policing illegal trade, bycatch prevention and reducing disturbance from marine noise. The largest known creature to ever live on Earth, blue whales are gentle giants. Also a type of baleen whale they mainly feed on krill and other plankton. Verified measurements of blue whales rarely exceed 28 m (92 ft), although larger animals were recorded during the whaling era. A very large animal could weigh close to 200 tonnes. Blue whales are usually loners and rarely form groups. Tagging during the Discovery investigations (1901-1904) indicated that most blue whales passed through South Georgia waters on their way to and from breeding grounds, off the coast of Brazil, and feeding grounds on the further south. In recent years, blue whale sightings around South Georgia have increased in number with many encounters occurring around Shag Rocks. During the whaling era, it is estimated this species was hunted to less than 5% of the original population and is now classed as Endangered by the IUCN. Humpback whales are part of a family of baleen whales, which are characterised by giant ‘baleen plates’ that hang from their jaws. These plates are used to filter small fish and crustaceans, such as krill, from huge gulps of seawater. Ranging from 12-19 m in length and weighing in at around 36,000 kg they are a common sight around South Georgia during the summer months but can be seen throughout the year. Feeding on the rich coastal waters they can often be seen in large dispersed groups along the north coast, breaching, rolling and slapping the water with their pectoral flippers. However, the cold waters of the Southern Ocean are not suitable for the whales to calve and so in the winter months many journeys north to the Patagonian Shelf. More information on the stamps can be found at www.pobjoystamps.com.